http://www.JewishWorldReview.com | it was the torture of elementary-school students in Deraa that gave momentum to the current Syrian uprising against Bashar al-Assad's brutal regime. The children, some as young as 10, were picked up by security agents for scrawling antigovernment graffiti on a school wall. When they were released days later, there were cigarette burn marks on their bodies, and the fingernails had been pulled from their hands. Word of the torture spread, outraging Syrians and helping fuel further protest. The government's response has been a deadly crackdown with appalling new levels of cruelty. "The stories we hear now are unimaginable in their brutality," a former Syrian intelligence officer who has turned against the regime told The Wall Street Journal recently. "It is not only to deter protesters. They enjoy hurting people for the sake of it." One such victim, a shopkeeper from Homs, was seized after leaving an antigovernment protest. As described by the Journal, the man was slashed with a scalpel on his back, then stitched up without anesthetic and beaten on the wounds. He was "kept naked and blindfolded in a room packed with detainees and excrement," where he listened to his cousin being burned with a poker, and was told to "kneel in prayer" before a portrait of Assad. Syria, a human-rights hellhole where more than 1,000 protesters have been murdered in recent weeks, is among the "Worst of the Worst" -- the 17 countries (plus three territories) identified by Freedom House as the most repressive societies on earth. 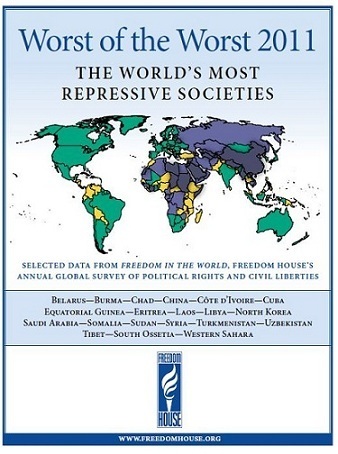 Founded in 1941 to promote freedom and democracy, Freedom House each year publishes a country-by-country survey of civil liberties and political rights in each country in the world. Those surveys show a world notably freer than it was 30 years ago, when the Iron Curtain still stood. But little of that light has penetrated to the nations needing it most. Three-fourths of the countries included in Freedom House's "Worst of the Worst" have been on the list for more than 25 years. They include North Korea, Somalia, Cuba, Myanmar, Saudi Arabia, China, Libya, and Syria. The endurance of those regimes -- which perpetuate themselves through violence, fear, and the ruthless persecution of dissent -- illustrate, as Freedom House puts it, "the deep entrenchment of the antidemocratic power structures in these countries and the difficulty of influencing them in any meaningful way." But the world's most atrocious dictatorships are sustained as well by the willingness of free nations to turn a blind eye to their crimes -- or, even worse, to make excuses for them. Secretary of State Hillary Clinton was justly slammed in March when she labeled Syria's Assad a "reformer," but Washington's appeasement of Damascus has long been a bipartisan project. The same is true of the zeal with which Americans and other Westerners seek to "engage" other human-rights villains from Beijing to Riyadh. There may be good reasons to do business with China and Saudi Arabia, but there is never a good reason to deny the moral gulf that separates totalitarian regimes from their subjects -- and from us. The New York Times reported last week on the thriving commerce between the United States and Equatorial Guinea, a tiny African despotism where torture and corruption are rife, and which Freedom House has ranked for decades among the "Worst of the Worst." US oil companies have billions of dollars invested there, a US military contractor provides maritime security and police training, and until March former Bill Clinton aide Lanny Davis even had a million-dollar-a-year deal to provide Teodoro Obiang Nguema, the country's vicious dictator, "with an image makeover." Not surprisingly, US diplomats don't go out of their way to speak bluntly about Obiang's hateful rule. Instead (in diplomatic cables released by WikiLeaks) they have praised his "mellowing, benign leadership" and advised Washington "to abandon a moral narrative" when dealing with Equatorial Guinea. But refusing to tell the truth about the world's most evil regimes, as Mario Vargas Llosa argued upon receiving the Nobel Prize for literature last year, only prolongs their brutality. "Dictatorships must be fought without hesitation, with all the means at our disposal," he said. "It is regrettable that democratic governments, instead of setting an example by making common cause with those, like the Damas de Blanco in Cuba, the Venezuelan opposition, or Aung San Suu Kyi and Liu Xiaobo, who courageously confront the dictatorships they endure, often show themselves complaisant not with them but with their tormenters. "Those valiant people, struggling for their freedom, are also struggling for ours."